I (Zoran) would like to thank the Daily Courier for taking constructive criticism seriously and providing a full and balanced article on this issue in their November 2nd 2010 edition. While we have all made poor decisions in our past, it takes character and courage to openly admit wrongdoing and correct it. Commissioner Candidates Pledged To Spend No Money = No Henrietta EMS Ever! The October 31, 2010 Daily Courier article entitled "County EMS Station Delayed' reports that a "small band" of County residents is endangering the health of folks in Henrietta, Caroleen, Avondale, Cliffside, Harris, Danieltown, and Sandy Mush. Are these Haters of Health for Henrietta real? Read on and you be the judge!!! If you are interested in helping others learn the facts about this issue, please feel free to print out our flier on this topic by clicking on this link. Exactly what two sitting commissioners and numerous county residents have been proposing for several months. Click here to view the full email from Mr. Holloman to the Rutherford County Government. The letter was made available as part of the Rutherford County Commissioner's Meeting Supplemental Agenda for the November 1st 2010 meeting. 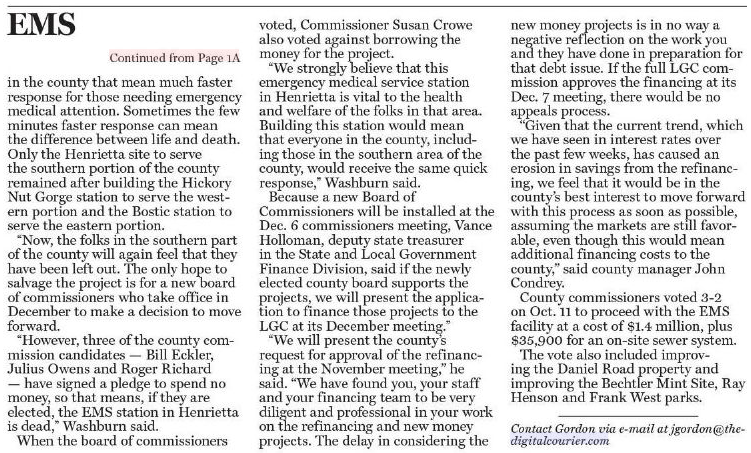 False: “….the Emergency Medical Service station, which would have been built in Henrietta, is being stopped by David Reno and a small band endangering the health of the folks in Caroleen, Avondale, Henrietta, Cliffside, Harris, Danieltown and Sandy Mush areas.” - Commissioner Brent Washburn as quoted in the article. # Concerned taxpayers petitioned the LGC to allow a vote of the people to decide if the county should go into further debt of approximately $6 million. # Commissioner Crowe, Commissioner Helton and many concerned citizens voiced support for the EMS station, requesting that the Commission Board separate the EMS project from the frivolous Daniel Road spending. Commissioners Washburn, McIntosh, and Holland refused to do so. 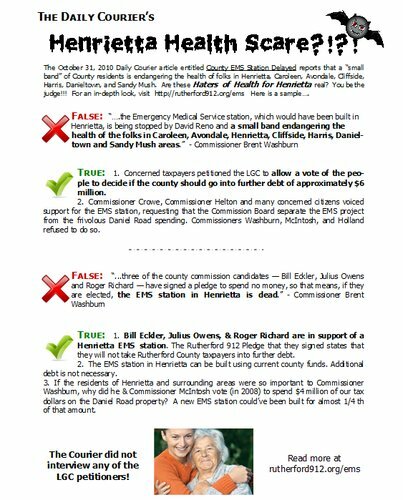 False: “…three of the county commission candidates — Bill Eckler, Julius Owens and Roger Richard — have signed a pledge to spend no money , so that means, if they are elected, the EMS station in Henrietta is dead. ” - Commissioner Brent Washburn as quoted in the article. # Bill Eckler, Julius Owens, & Roger Richard are in support of a Henrietta EMS station. 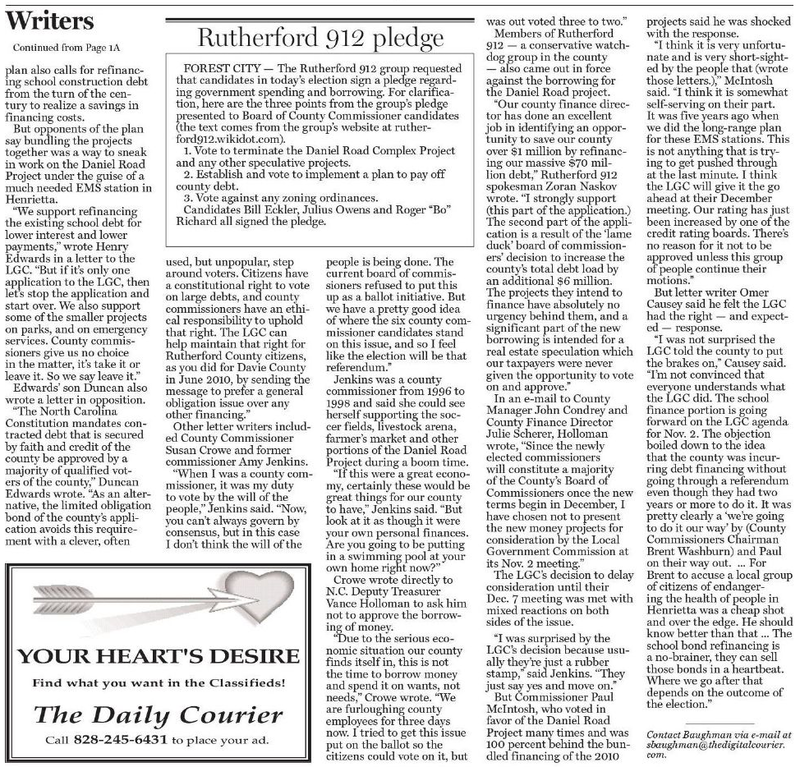 The Rutherford 912 Pledge that they signed states that they will not take Rutherford County taxpayers into further debt. Click here to read the details on the pledge. # The EMS station in Henrietta can be built using current county funds. Additional debt is not necessary. # If the residents of Henrietta and surrounding areas were so important to Commissioner Washburn, why did he & Commissioner McIntosh vote (in 2008) to spend $4 million of our tax dollars on the Daniel Road property? A new EMS station could have been built for almost 1/4th of that amount. The Daily Courier did not interview any of the LGC petitioners whose full names it listed in the article. Only county government employees and elected officials were given the opportunity to make statements about this critical topic.